I’ve played every Battlefield game apart from the first Bad Company and Hardline. I’ve tried every game online apart from 1942 and Vietnam and I think Battlefield 1 might have the best online action of the series since Battlefield 2, a game which I still rate as one of the best (though flawed) online shooters. What I like about Battlefield 1 is that it has stripped away some of the excess fat that had grown around series over the years, while also improving in some key aspects. After playing the open beta and goings hands on at EGX, I wasn’t convinced that the game would succeed in multiplayer. Having played it online on live servers, I can say that it works. It isn’t perfect, no Battlefield game would be complete without its fair share of bugs (though I haven’t experienced any game breakers so far), and complaints about balancing. Bug wise, I’ve experienced a few niggles with the squad system. In one round I couldn’t join any open squads, or even create my own. There is also the trouble of people locking squads when joining a game as a party. For a series that had a great squad system in Battlefield 2, it is frustrating that problems are still arising. Small things, but the new spawn screen is gorgeous. The balancing concerns lie around the Behemoths that can come to dominate a map, but despite inflicting heavy casualties, they won’t always turn the tide of battle back in the losers’ favour. A team with any modicum of sense will quickly set out to destroy the Behemoth and in most maps, there are plentiful ways of doing so. Planes are plentiful on maps where an Airship can appear, while a combination of fast attack boats and planes can quickly take down a Dreadnought. I’m not convinced that the Armoured Train is suitable in all circumstances though. In one fight through the Argonne Forest (one of the finest infantry maps), one of these beasts appeared towards the very end of the round. It didn’t appear early enough to swing the tide of battle, but on a map without any other vehicles, it could prove to play too decisive a role in the action. While I’m not over the moon about the Behemoths, I am suitably impressed by planes, something I haven’t been for many a year. 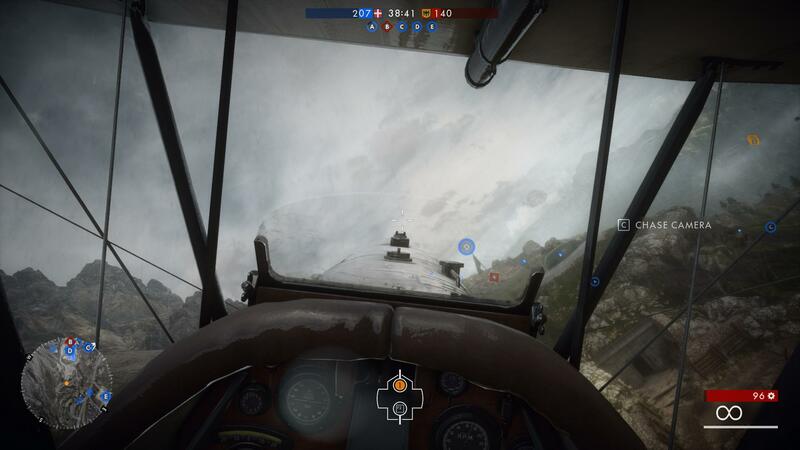 Not since Battlefield 2 (and only during some patches) have I felt that planes complement the battle waging on the ground without being a depressing tank-busting sight or feeling that they live in an entirely different game with maps too small to handle their speed. Operations are new, and a must play. Offering historical context along with great action. This is where the setting of Battlefield 1 shines (as much as that makes me cringe to write considering it is set during The Great War) as their slow speed means even amateur pilots like myself can keep them in the air for more than twenty seconds, and their fragile airframes remove the need for dedicated anti-air tanks or equipment. Gang together with some friends and you will soon do enough damage to a fighter to take it down, while working with pilots, you can help rid the battle of pesky lone snipers. Another neat trick that applies to both planes and armour, is that you can only spawn into one from the spawn screen (where you can select the type of plane or tank you want). Gone are the dark days of Battlefield 2 where hordes of fly-boys and tankers would hang around at the main base waiting for their desired weapon of destruction, oblivious to the wider battle. With the spawn timings of the vehicles seemingly random, you are doing your team a disservice by waiting at the spawn screen for one to appear. The ground action itself it thoroughly enjoyable, as it often is in Battlefield games. But the change in weaponry from modern automatics to bolt action and early semi-automatic rifles and ratty-tatty light machine guns is welcome. The changes just slightly alter the pace of the action, bringing it down just a touch. You don’t feel like you are playing a different game, but it’s enough to bring things back to the days of Battlefield 1942, a game I played for hours on end against the bots. That doesn’t look too good…. The action is of course aided with some very fine maps. 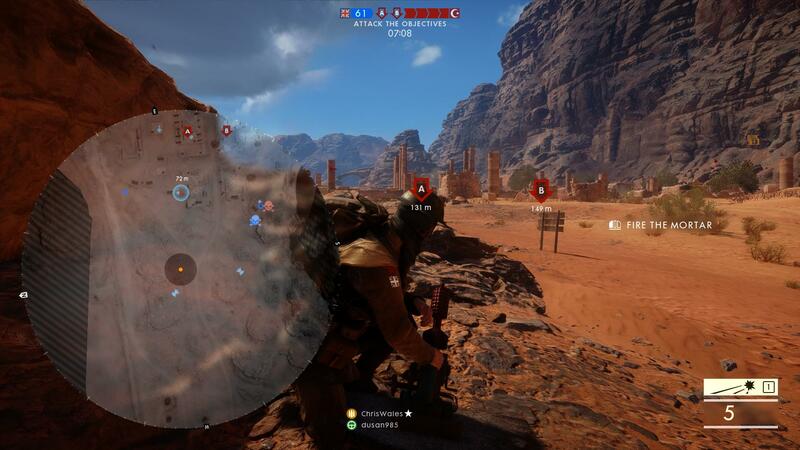 During the open beta, I wasn’t convinced by the Sinai Desert map in Conquest mode, but close it down for a game of War Pigeons or Rush, and it feels just right. The Argonne Forest is a formidable infantry grinder full of bunkers, trenches and dense foliage to hide in. Monte Grappa is full of Alpine charm and offer a brilliant mix of air, ground and armoured warfare. Clambering around the rocks and knifing an unsuspecting sniper is delicious. Amiens offers a city environment waiting to be blown to smithereens while Ballroom Blitz is a majestic tour around French grandeur. Until the bullets fly. 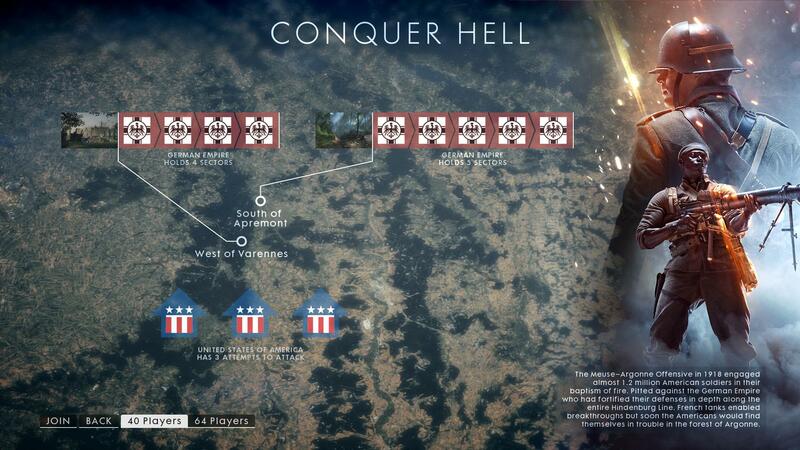 What is perhaps best is the way the maps alter depending on the game mode you are playing. Playing War Pigeons (effectively a capture the flag without home bases) in the Sinai Desert focuses the action on the town, while Rush (with telegraph stations replacing M-COM stations) sees you advance from the desert outside town offering a mix of everything you want if you progress as an attacking force. The heart of multiplayer though are Operations, a game mode complete with narration during loading to set the historical context and adaptable instructions from generals depending on how the course of battle plays out. They best described as a mix of Conquest and Rush and each Operation is spread over two or three maps, depending which one you choose. Not being able to aim down the sights adds to the claustrophobic feeling of the gas masks. The attackers have three attempts to conquer the four or five sectors on each map with each death ticking away at their ticket count. If they can’t conquer the map in their three attempts, they done for. The defenders have unlimited tickets, and must prevent the attackers capturing the flags at strategic points in each sector. Lose control of the sector, and the battle moves onto the next part of the map. Operations are a great blend of all the elements that make Battlefield great, and are the one game mode where a Behemoth feels like it justifies its place in the action. 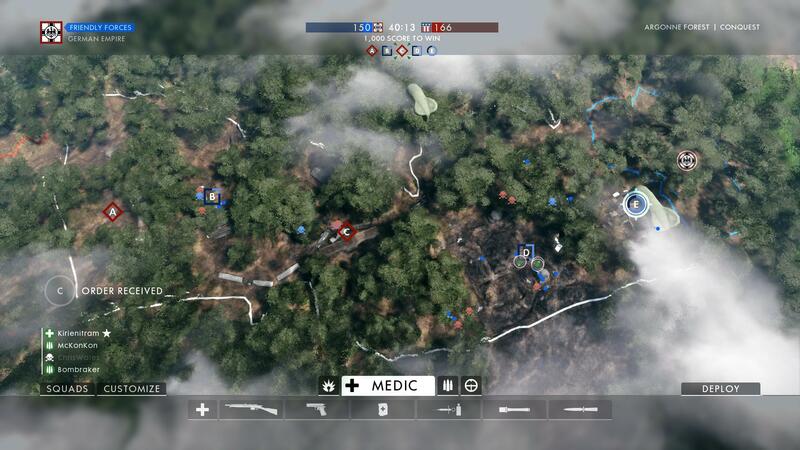 Team work is required to capture and hold the control points in each sector, and medics are essential for the attackers to prevent their tickets bleeding away. 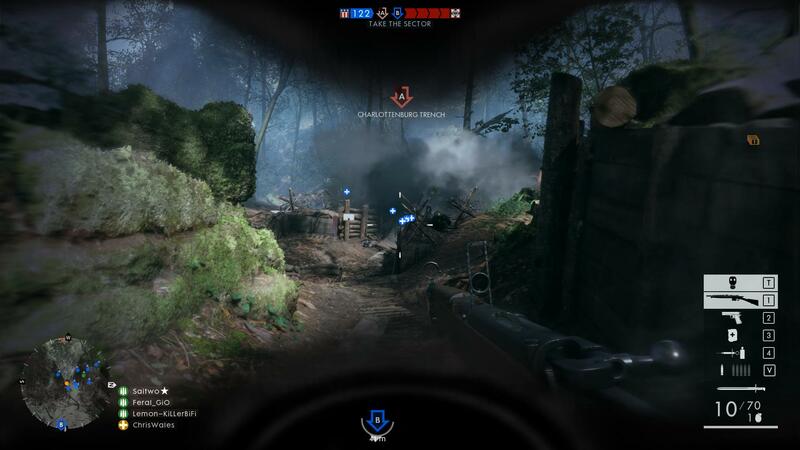 As the front-line changes through the action, you get to experience every aspect of the majestic maps that DICE have crafted. Ballroom Blitz takes you from the trenches outside the Château, to the outer courtyards then the middle of house itself. Finally, you end up attacking the gardens at the rear to complete a truly astonishing battle. One of the more understated changes that DICE have made with Battlefield 1 has come with the changes to the progression and unlock system. You still receive stupidly large amounts of points for every interaction (bring back the 2 points for a kill from the early games please), but you can now target different medals to achieve through the week with a medal rewarding you with a hefty bit of bonus XP. Medals have various stages to complete, with a stage being as simple as getting 10 kills in a round or more specific such as reviving 20 squad members. The medals rotate on a weekly basis, each with different requirements, and they will surely have the long-term aim of promoting team and squad cooperation, along with class diversity. Mortars require some skill, but can be powerful tools. Classes have been pared back to Assault (with anti-armour tools), Medic (to revive and heal comrades), Support (heavy weapons and ammo supply) and Scout (snipers) along with Pilot or Driver kits for spawning in planes or vehicles. A simple, and clear, mix of roles and responsibilities that players will become more accustomed to over time. As you progress through the ranks, you will also progress through Class ranks, both of which will unlock different weapons for purchase with War Bonds (earned with promotions). Some weapons are Class specific, while others can be used across the classes. And unlike previous games in the series, there are a sensible number of weapons to unlock (many are simply variations on a Factory weapon model) with a limited number of attachments for each. I’m all for cutting down on the number of unlocks and customisation options, in recent years across the FPS genre the number of different weapon configurations has become something of joke. We will never go back to the straightforward days of 1942 or Vietnam, but we have a fine balance here. I have no doubts that Battlefield 1 won’t be for everyone. Some will miss the modern weapons and vehicles, others will find the slight change in pace of the combat frustrating. 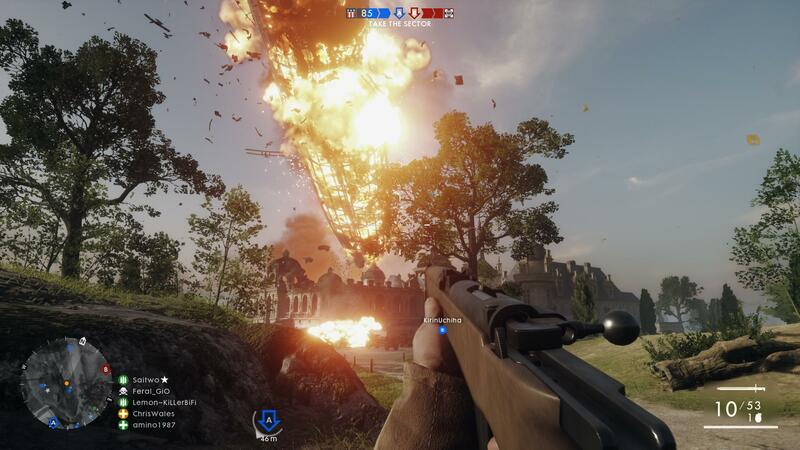 On the whole though, DICE have done a stupendous job with Battlefield 1s multiplayer component. There are some stunning maps to behold with the game modes offering a pleasing variety to the action. Weapons and vehicles (especially the planes) are generally, well balanced, and I for one haven’t experienced any game breaking bugs. It’s disappointing that the French and Russian armies aren’t present yet, and I’m holding out hope they will appear along with some singleplayer, but overall? This is a great game.